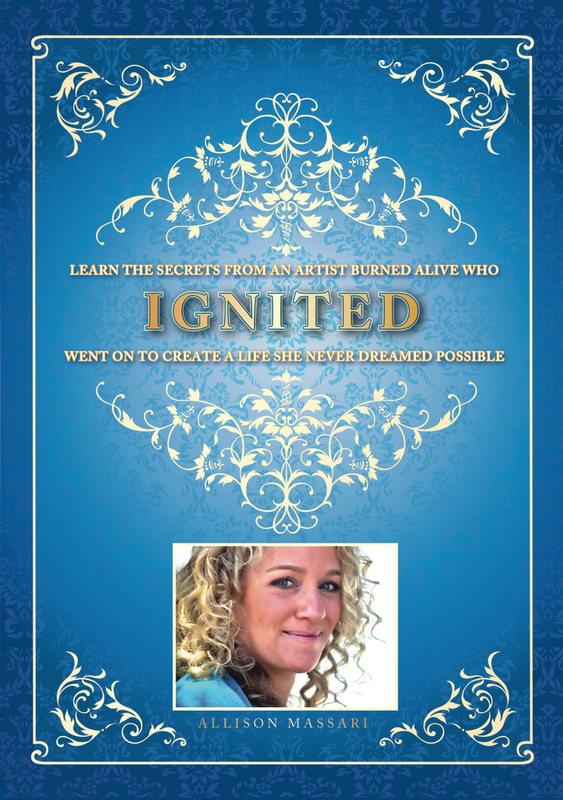 Ignited by Allison Massari is the astonishing story of one woman’s courageous journey to seek and find gratitude, forgiveness, and happiness after traveling to the extremes of human endurance. This audio book is a must-have if you have faced adversity in your life. You will refer to it again and again – Especially CD #4. Packed with incredible skills for successfully understanding and moving through life’s difficulties. From international keynote speaker and acclaimed visual artist Allison Massari, a profound and life-changing program that provides listeners tools to achieve self-mastery, a peaceful heart, and excitement for embracing life. As the survivor of two devastating car accidents, one where she was severely burned, conscious the entire time, and suffered second and third degree burns on over 50% of her body, Allison knows what it takes to heal. With authenticity and compassion, she precisely explains her journey and how she used suffering to shift to higher levels of awareness and ultimately into a more peaceful and grounded life. Recognized for her soothing voice and extraordinary storytelling, Allison takes listeners on a journey in this compelling 6 CD audio book. She shows how love is the spark that ignites the ordinary and the difficult – and propels it into the miraculous. Techniques on moving out of anxiety and worry – discover an inner calm. Learn to manage feelings of betrayal with compassion, love and forgiveness. Experience a new mindset to overcome adversity and everyday challenges in life. Guidelines to create against-all-odds positive outcomes. Two rules for releasing anger. Tools to successfully deal with a difficult person. Find out, “Does everything happen for a reason”? What to say, and what not to say, to someone who is suffering—Why using clichés is not a good idea. Book signing in Toronto, Canada after the OHA Keynote. I bought it and loved it! I laughed, I cried… I felt a sense of hope like never before. Your words are such a part of me everyday. You are carrying such a powerful message! Thank you for sharing! “I met Allison a couple years ago…and found her to be a generous and kind soul… I was so moved by her audio gift. I highly recommend listening to it. What an inspiration and a true testament to the power of the mind. . . and play in our lives. Thank you, Allison.